Subway tiles are probably the oldest and one of the most widely used backsplash tiles till date. The subway tiles have been around since the early 1900s and started to gain popularity in the 1930s. This is a tile design that you would normally get to see in a subway and its rectangular in shape. It will be like a line of bricks lined up in a horizontal line. These types of tiles were used in the subways and slowly found its way into the designing of a house. You will tend to find subway tiles in most of the country style houses and is still widely used by home designers. The firm Heins & LaFarge were the first to create subway tiles. Two artists George C Heins and Christopher Grant LaFarge were the brains behind these tiles. They are both related to the renowned stained glass artist John La Farge. At the turn of the 20th century Beaux Arts architecture was the style that was gaining popularity and it was greatly due to the efforts of these three artists. Heins & LaFarge began working with Rookwood Pottery and Grueby Faience Company who were both prolific ceramic manufacturers to produce a tile that was heavy duty and was able to maintain its looks even after frequent scrubbing and cleaning. It is that very design that they incorporated in early 20th century that is in use even today and that speaks volume of the great designers they were. With better durability and the ability to withstand regular scrubbing and cleaning, it is not a surprise that the subway tiles found its way into the kitchen. Just like in a subway, a kitchen tile will have to deal with a lot of cleaning as there is bound to be splattered while cooking and cleaning of dishes. Subway tiles are stain resistant and are made of ceramic, which is moisture resistant. This allows you to clean the subway tiles with ease. Ceramic is considered to be a good material where hygiene is of importance as ceramics do not retain allergens or stains and is able to withstand high temperatures. Moreover, as the color of the tile is fired directly onto the surface, it does not fade when exposed to sunlight and high temperatures. 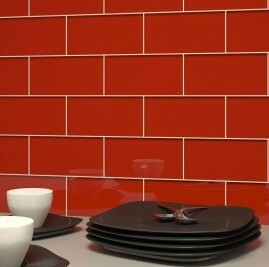 Subway tiles are cheaper than stainless steel tiles and glass tiles and this allows you to stay within your budget. With a whole host of advantages in maintaining subway tiles, it is not a surprise to see the popularity of subway tiles. But earlier subway tiles used to come only in white and that was a restriction while designing a kitchen. Nowadays, subway tiles are available in a wide variety of colors, designs and textures. This has opened up a lot more design opportunities while using subway tiles for your kitchen. The usual size of a subway tile was 3x6 inches and that size is considered to be a classic. But nowadays subway tiles are available in various sizes like 4x4, 4x8, 4x10 inches and this has added to its popularity. The famous subway tile has had a makeover and is now a lot more fashionable that what it used to be. If you are interested in knowing the different types of subway tiles that are on offer nowadays check out wholesalersusainc.com and select a subway tile of your choice.